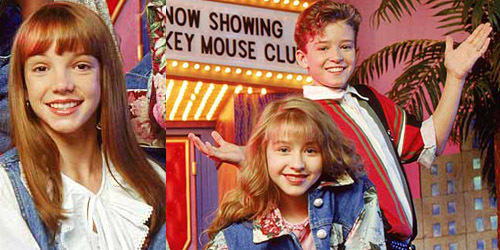 20 years ago, three tweens auditioned for the cast of The Mickey Mouse Club and from then on, music history would never be the same. Britney Spears, Christina Aguilera and Justin Timberlake rose to the top of the charts in the heat of the late 90’s bubblegum pop explosion with hit albums and singles, eventually branching out into reality television, film and other endeavors. I was 3 in 1993 when the trio first made their mark on the Club; the show was done the next year (though I saw it in repeats) and I’m betting a lot of people didn’t think those performers would do anything substantial. Heck, The Party, the quintet formed from cast members in the early 90’s, had only one top-40 hit and they were done. No big deal there. Something was different with Aguilera, Spears and Timberlake. The latter two joined groups; one flopped and one flourished. I think you know which one is which. The two ladies then pursued solo careers, all three became superstars, etc. That was then. I’m now 23, and all three of them are top ten on iTunes’ top-selling songs chart, the first time that this has likely ever happened, or at least one of the first. As of the early morning, Timberlake’s “Suit & Tie” (featuring Jay-Z) stands at #5, Aguilera’s feature on Pitbull‘s “Feel This Moment” is holding down #8, and “Scream & Shout” by will.i.am and Spears is down to #9. At CHR radio, “Moment” is the only one to not be within the top ten, but its large gains should put it there soon. (It’s currently #16; “Scream” is #4 and “Suit” is #10.) Since I like to focus on the radio aspect of the industry, I thought it would be interesting to point out the last time that all three singers were simultaneously in the top 40 and in the top 10 together on the format. Trust me, it’s been a while. Each singer has had their shares of ups and downs over the years, but this unification of the three so high on the charts nearly 15 years after each singer debuted at radio is certainly something to be celebrated. In this example, Spears was on the decline after peaking at #1 for two weeks in late December and early January. “Dead” was in its second week in the top 40. The collaboration with T.I. would eventually peak at #4 in April. Aguilera’s “Better” quickly peaked at #11 for two non-consecutive weeks in late October and early November before quickly falling, though it spent several weeks in the 30’s (and this last week at #40) thanks to year-end chart airplay. All three would make the top 40 several times between then and their current songs, with Aguilera accumulating the last singles (2), followed by Timberlake (3; all featured appearances) and then Spears with 8. Often times, two of them would be in the top 40 at the same time, but nothing panned out between the three until now. Spears once again comes in highest on this survey with her first single from In The Zone. It was at its peak, though it hit the #10 spot unofficially at midweek. Next release “Toxic” would return her to the top after a four-year absence. Aguilera’s song was trending downward after spending a month at #3 starting in mid-September. It was the fourth single from Stripped, the biggest of which was “Beautiful”, her fourth and last #1 on the CHR chart to date. This was the last week in the top 40 for “Señorita”, probably the least remembered release from Justified. It too was a fourth single, and spent two weeks at #5 in September. I wasn’t really a fan of it back in the day, though I’ve learned to like it over the years. He largely remained absent from the charts until 2006, then Spears had zero charting singles between late 2004 and late 2007, and Aguilera became really hit or miss after the Back To Basics era. In short, things didn’t match up until the beginning of 2009. You see how rarely these things happen. “You’re kidding me!” Nope, our three Mouseketeers haven’t been in the top ten together on the pop chart since the summer of 2000, nearly thirteen years. I remember it well. Spears was spending her last of three weeks at #1 with “Oops!” before Timberlake and his group would take over the #1 spot for six weeks. Both acts were riding high on albums that sold north of one million copies in their first week, with *NSYNC‘s No Strings Attached pulling in a record 2.4 million copies in sales during its first seven days on shelves. (Let’s not forget that a fourth member of the Club, JC Chasez, was also in the group.) Aguilera didn’t exactly see the same numbers, but her debut album put four singles into the top ten, “Turn” being her third. It peaked at #6 a few weeks earlier. 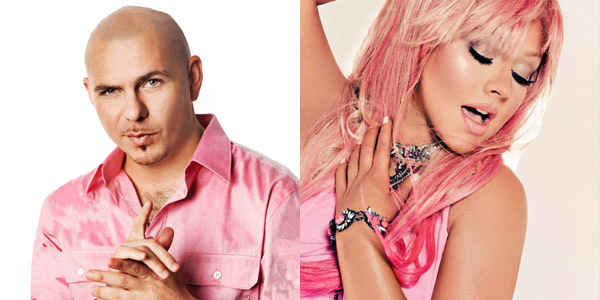 Pitbull and Christina: in the pink. Miami-born rapper Pitbull has been in the doghouse lately… at least when it comes to hit singles. After a stellar 2011, including a feature on Jennifer Lopez’s comeback hit “On The Floor” and one of the top-played songs at CHR radio, “Give Me Everything”, the performer has released a few singles to mixed reaction this year. Just a few months ago, he was riding the charts with “Back In Time” from the soundtrack to Men In Black III, which essentially mutilated a sample of Mickey & Sylvia’s 1957 hit, “Love Is Strange”, into a tune that may as well have been titled “This Song’s Strange.” Given that it was from a movie, the shelf life wasn’t long, and it quickly peaked at #11 on the Hot 100 (ironically, the same peak as “Love Is Strange”) before falling off the face of the Earth. Next to be released was “Get It Started” which featured the she wolf herself, Shakira, but by the end of its chart run, it seemed they were both crying wolf. The “leadoff” single from Global Warming (reduced now to a bonus track on the 16-track deluxe edition), it coughed and sputtered up the CHR airplay chart and settled somewhere in the 30’s before being pulled in favor of his current single, “Don’t Stop The Party”, which may make the top 20 in airplay but that’s about it. That one relies on a sample of Toots and the Maytals’s “Funky Kingston” and it’s more junky than funky. So, now we come to the fourth release from the rapper’s album entitled “Feel This Moment” with a hook done by, well, I think you already know her name. It’s Godtina Aguilegend, the voice of The Voice, Christina Aguilera. Aguilera is coming off of an underperforming lead single, “Your Body”, with a second single duet in the wings called “Just A Fool” with fellow The Voice judge Blake Shelton. It looks like a master plan for sure to get her back to a solid place on the radio with both a dance single and a ballad, so I guess we’ll have to see if it actually pans out that way in 2013. The chorus of “Feel This Moment” is probably the highlight of it as Aguilera’s belting isn’t as all-over-the-place as usual and it’s simply just a nice hook. She croons, “One day while the light is glowing/I’ll be in my castle golden/But until the gates are open/I just want to feel this moment.” Now, this is coming from a superstar who once sang about how “it’s so empty living behind these castle walls,” on the chorus of T.I.’s “Castle Walls”. Did something happen in the last two years? It’s not like our fair maiden can judge new talent from the corner room of her ancient estate waiting for Prince Charming to ride upon his stallion and rescue her. They may as well just keep her locked in there. If she can’t restrain her voice, why can’t they just restrain her? The building drumbeat continues and wait–what is that I hear? Oh lordy, Pitbull has done it again, interpolating the melody from the band a-ha’s international hit from 1985, “Take On Me”. It’s a pleasant piece of 80’s pop that probably isn’t recognizable to a younger generation, but goodness, does it sound odd on this track. I suppose they needed something extra so that the song didn’t sound exactly like a rip-off of “Primadonna” by Marina & The Diamonds, so I’m guessing Pitbull and his team stuck a page of all the #1 songs from the 1980’s on a dartboard, took a swig of his vodka brand, and somehow landed on our Norwegian friends. Who am I kidding? They probably need a little extra cash on the side; those royalties can only go so much. Is it the worst thing in the world? No. Was it necessary? Absolutely not. The lyrical matter is nothing new: making money, partying, suits, although I suppose this time around, the black suits aren’t comin’. (You might want to go “back in time” if you can’t figure out that one.) Pitbull doesn’t say anything in Spanish until almost 52 seconds into the song, which must be a new record for him, and it’s an “oye mamita” for once. Also, apparently, he’s “undefeated like Zula,” which must mean he’s the cat’s meow, if you know what I mean. Wait, I thought he was a dog. Is he a CatDog now? I’m confused. Purchase “Feel This Moment” on AmazonMP3. Listen to “Feel This Moment” on YouTube.